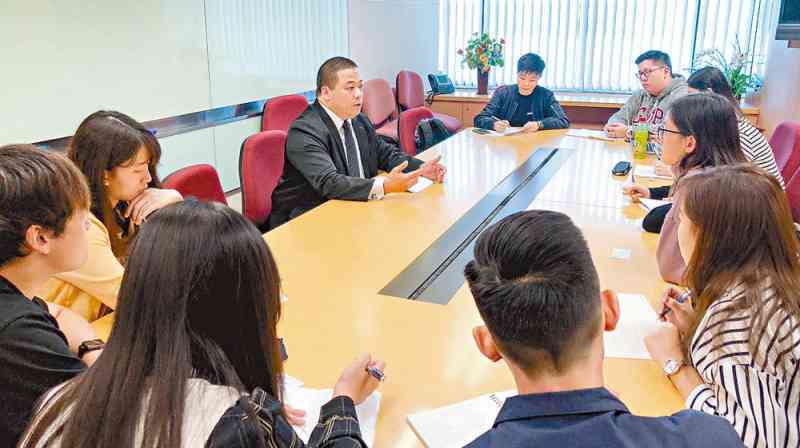 Over 60 students participated in the opening ceremony of the Co-Creation Project held by the Police Public Relations Branch (PPRB) at the City University of Hong Kong (CityU) on October 19. The PPRB engages people from different sectors as partners in a bid to find ways to deal with unsolved problems through innovative thinking. The project provides a platform for the Force and university students to work together. The Force gives crime figures to students studying criminology for conducting crime trend analysis with a view to formulating crime prevention strategies. To facilitate the project, the PPRB arranged five officers to share with students their experience of fighting different types of crimes, such as deception, sexual offence, cybercrime, child abuse and elderly crime. The five officers were Superintendents Chan Tin-chu, Ng Chui-ting, Lam Cheuk-ho and Chong Shing-yat and Chief Inspector Ho Kam-yee. The project was successfully rolled out with the support of CityU, in particular Professor Eric Chui and his students. Professor Chui works in the Department of Social and Behavioural Sciences, College of Liberal Arts and Social Science, at CityU. He is also a member of the Junior Police Call Central Advisory Board and has contributed to the launching of the Co-Creation Project.